Darlene tells me every now and then I should post some non-Cool Jerk art on this here blog. Well, here’s a little gem from 1976. As some of you may know — either through my astonishing tales of yesteryear or from first-hand experience — my second grade was unlike any I’ve ever known. Mrs. Joyce Frank turned our Ralya Elementary (Haslett, MI) classroom of 30 desks into a freaking CITY. “Super Citizen City” was its name, actually. And there isn’t enough time in the day to impress upon you how incredible it was. Sure, we learned the three “R”s, phonics and cursive, but we also learned about federal, state and local government and each student had a role (I was a federal judge, IIRC). We also learned about commerce (we each had to create a store to sell our own hand-made goods) and assembly lines (for craft projects and the Yellow Pages-sized yearbook each kid received on the last day). Good grades earned us “money” and we could buy toys and candy with our hard-earned currency. For the major holidays we each made papier-mache decorations (pilgrim and turkey, Santa Claus in a chimney, etc.). And we each made a mobile. 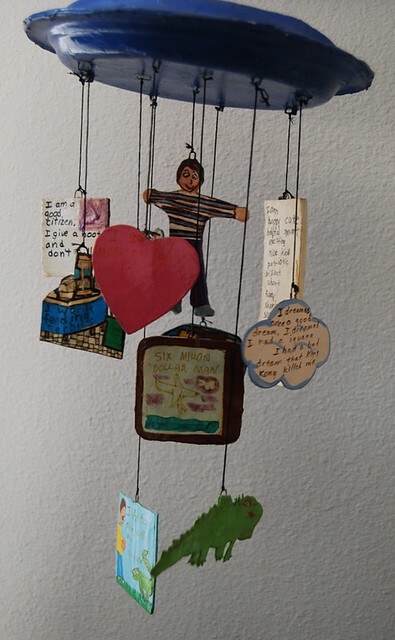 The mobile was a personal reflection of each student. It had to contain a self-portrait, your house, your pet or pets, your favorite food, your favorite TV show, some of your memorable dreams, a list of your positive qualities, a testament to your patriotism (this was during the Bicentennial, after all), your loves and favorite activities. 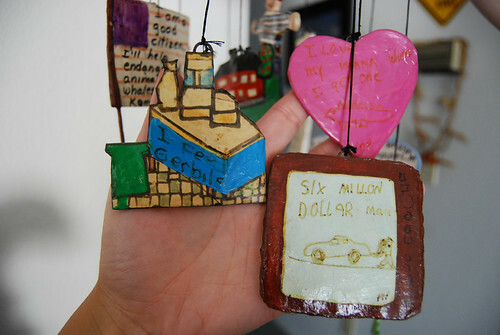 Each art element of the mobile had to be drawn and colored by the student, front-and-back, then reinforced with a sturdy middle layer, then varnished. Mrs. Frank helped out with art touch-ups and lettering where necessary. My interests that year pretty much revolved around Godzilla movies, Six Million Dollar Man, “Jaws,” my pet iguana Igszy and social networking (except back then, “social networking” was actually “talking in class when I shouldn’t be”). While my art skillz have certainly improved over time, you can see my ability to draw cars pretty much plateaued when I was 7. In the "I feed gerbils" piece, I tried to draw a green pleather ottoman, wetbar and a Habitrail system on a tile floor. In the heart, I talk about loving my soon-to-be pet iguana. In the "Six Millon (sic) Dollar Man" piece, that's Steve Austin lifting the back of what I can only imagine was a car. I’ve actually hanged the mobile in every place I’ve lived (when Darlene first saw it a decade ago, she wondered if I secretly had a grade-schooler). It’s gotten a little faded but looks pretty good after nearly 35 years. Thanks to Facebook, I’m in contact with about 25% of my second grade alumni and I bet they all still have their mobiles, somewhere. That is freaking awesome! I still have a stupid turkey that I made out of construction paper.I accidentally cut out of the line and chopped it’s head off. I stapled it back on… and it’s still there! I love this post! Great insight into young Paul! I’ll be expecting my ‘I like waffles’ shirt anyday now, thanks. Does the piece in the back say, “I give a hoot”? @KeithG: TURKEYSTEIN! Last I saw of my turkey, its neck was a bit thrashed, too. @justJENN: It looks like an outline of a dog (BOY dog at that), made of gravy, lying on a cheese single. 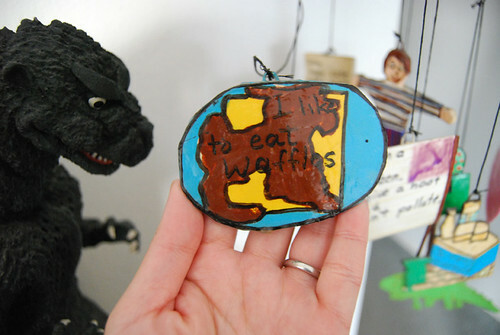 The other side shows at least a half-assed attempt to draw the little squares on the waffle. @Marina: Yes indeed — “I am a good citizen. I give a hoot and don’t pollute.” And that’s on an American flag (somewhat faded over time). That mobile is awesome, man. I’m surprised it hasn’t disintegrated by now! I’m also surprised no one’s mentioned the Godzilla head. howdy Cool Jerk. I like this blog post. Fun to see all the old vintage stuffs! that is SO RAD that you still have this!!! my brother was totally into the six million dollar man. he and our cousin buried the Steve Austin doll along with the Oscar Goldman one in my aunt’s flower bed – she was so PO’d because they destroyed the flowers and left a huuuge mess! haha. Good times! @Lee: Yeah, I’ve been lucky that it’s only faded a little bit on a couple of parts.